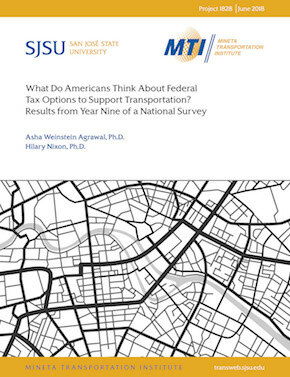 This report summarizes the results of the ninth year of a national random-digit-dial public opinion survey asking 1,201 respondents if they would support various tax options for raising federal transportation revenues. The ten specific tax options tested were seven variations on raising the federal gas tax rate, two variations on a new mileage tax, and creating a new federal sales tax. In addition, the survey collected data on standard sociodemographic factors, travel behavior (annual miles driven and vehicle fuel efficiency), respondents’ views on the quality of their local transportation system, and their priorities for government spending on transportation in their state. All of this information is used to assess support levels for the tax options among different population subgroups. The survey results show that a majority of Americans would support higher taxes for transportation – under certain conditions. For example, 72% of respondents supported a gas tax increase of 10¢ per gallon to improve road maintenance, whereas support dropped to just 34% if the revenues were to be used more generally to maintain and improve the transportation system. For tax options where the revenues were to be spent for undefined transportation purposes, support levels varied considerably by what kind of tax would be imposed, with a sales tax much more popular than either a gas tax increase or a new mileage tax.